A modern retelling of Balzac's classic Cousin Bette by one of America's most prolific and significant writers. Earl, a black, gay actor working in a meatpacking plant, and Bette, a white secretary, have lived next door to each other in the same Greenwich Village apartment building for thirty years. Shamed and disowned by their families, both found refuge in New York and in their domestic routine. Everything changes when Hortense, a wealthy young actress from Ohio, comes to the city to "make it." 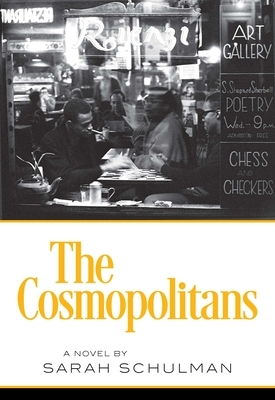 Textured with the grit and gloss of midcentury Manhattan, The Cosmopolitans is a lush, inviting read. The truths it frames about the human need for love and recognition remain long after the book is closed. Sarah Schulman's love of New York is evident in The Cosmopolitans, her 9th novel and 16th book. Distinguished Professor of the Humanities at CUNY, her honors and awards include a Guggenheim in Playwriting and a Fulbright in Judaic Studies. A well known literary chronicler of the marginalized and subcultural, Sarah's fiction has focused on queer urban life for thirty years. Her nonfiction includes The Gentrification of The Mind, a memoir of the homogenization of her city in the wake of the AIDS crisis. Her plays and films have been seen at Playwrights Horizons, The Berlin Film Festival and The Museum of Modern Art. An AIDS historian, Sarah is co-founder of the ACT UP Oral History Project. She is on the advisory board of Jewish Voice for Peace and is faculty advisor to Students for Justice in Palestine at the College of Staten Island.